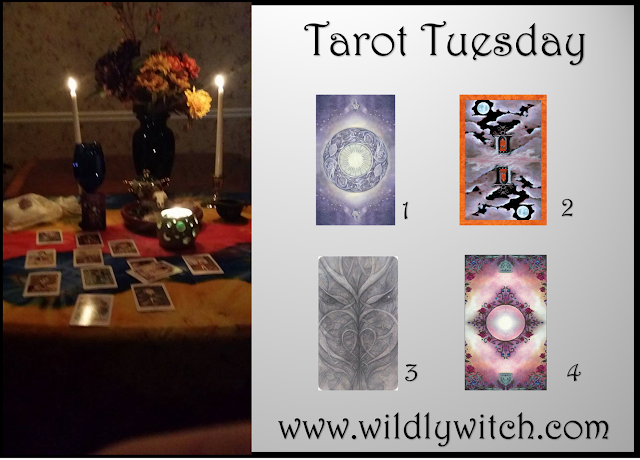 It's Tarot Tuesday! This is the day we hone our intuition skills! If you haven't done this before, please ground yourself first (relax, close your eyes for a moment, take some deep breaths, connect to the earth). Now, select your number based on what speaks most to you. Be careful about choosing "the pretty card back." It can be deceiving. Let your intuition speak. The 6 of Wands is a very positive omen. It can indicate that despite the challenges you are facing, you will overcome them and come out on top. This card also points toward literal or metaphorical movement; things are changing, in a positive way. In general, the 6 is about happiness and celebration. You are about to see some results for your hard work and efforts. Give yourself a break or treat yourself in some way. You have certainly earned it. 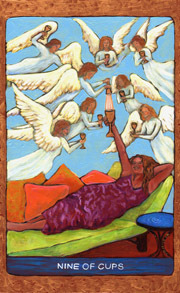 The 9 of Cups is one of the most uplifting and pleasant cards to receive in a reading. Known often as the "wish card" it can mean that what you are hoping for or dreaming about most is very likely to be yours – in a brief period of time, generally, too. When you picture a Tarot reading in your mind, even if you have never seen a deck of cards before in your life, you are hoping for a card to come out that confirms you will be getting everything you are wishing for. 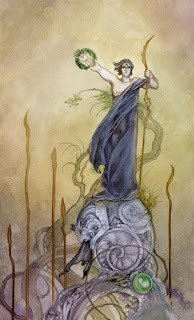 Every Tarot reading starts with the desire for your psychic to pull up the Nine of Cups. The appearance of this card is usually a portent of happiness, and good things about to come. It also usually means that what you want is likely to come into being in your life. If asking a yes/no type of question, this card is the most powerful indicator of "yes." Just remember, nothing is set in stone. You must put in the effort to achieve what you want in life. If you're waiting for news from someone or something, you are likely to like what you hear. The Knight of Swords can point to lots of activity, travel, being out and about, getting things accomplished. You are unlikely to feel like waiting for anything to come to you; that's a good thing… go after your heart's desire. In relation to work questions, this is a particularly good omen if you are looking for work. A job that is just what you've been hoping for may suddenly come your way. If already employed, things are about to get a lot busier, in a very positive way. Things in general are very likely to be going very well for you. 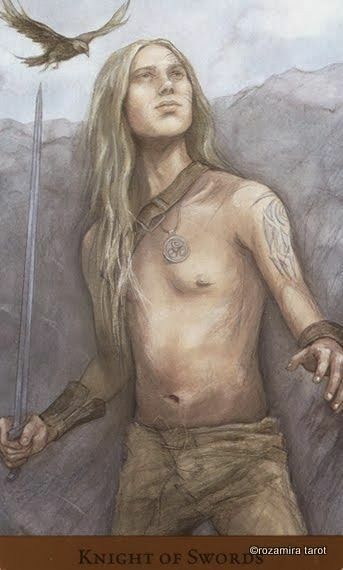 However, even though finances are likely to be in good shape when this card appears, that does not mean that you should lose focus on what is truly important in life, and money is not very high on that list. This is a good time to socialize, to meet new people, and to get out and about. Money is likely to be better than usual. Your health and feelings are in a good place.This is a time when you are very likely to be able to see the truth with a capital "T" about life; which is that there is a great deal of beauty, joy and happiness to be found in this life, if you are looking hard enough and in the right places. Spread this very important message. This is a great time to try different spiritual approaches on for size to see if any of them work for you. So, how did you do? Are you finding these exercises helpful? How else can I support you in honing your intuition? The best conversations happen on the Facebook page, so come on over, give the page a like, and meet some new wildling friends while you're at it! We look forward to hearing from you!